The hosts know that they have to keep winning to stand a chance of pushing their way into playoff contention while the Turkish side are the highest ranked team who are yet to book their place in the Euroleague playoffs for this season. However, that may not be too far away and we have both teams looking around at other scores to determine their future in the competition. If Bamberg lose the game and Anadolu Efes Istanbul win earlier on Thursday night, the Germans will bow out of the race for the playoffs. This places a high level of pressure on the hosts for this game. The Turkish side knows that if they grab a win, other results could rubber stamp their playoff spot. A win for Fenerbahce and Efes and Belgrade losses on Thursday would be all that was required for the Turkish side to progress or there is also the fact that if Fenerbahce win and Darussafaka loses on Friday, Fenerbahce progress. This means that there will be a lot of eyes on the Turkish teams this week in Euroleague action. These sides have only met on three occasions and it is the Turkish side that holds the advantage, sitting with a 1-2 record. These two teams met in the opening week of the season and it was a narrow 67-66 win in Turkey. Pero Antic was the last minute hero with free throws. Darius Miller is likely to be the key player for the home team and he has provided an average of 12.7 points per game while Nicolo Melli has chipped in with an average of 12.2 points per game. Brose Bamberg will be without Janis Strelnieks in this game though, which makes the process more difficult for them. Key players for the Turkish side are Bojan Bogdanovic, who has offered an average of 14.3 points per game and Ekpe Udoh, who has offered an average of 12.3 points per game. Bobby Dixon has also offered 10.5 points per game, so there are players that can make an impact for the Turkish side. 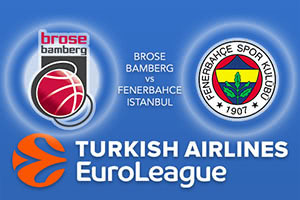 Both sides need the win but take Fenerbahce Istanbul at -2.5, which is provided at odds of 1.90. If you’re looking for the Over/Under market, go OVER 153.5 which you can find at odds of 1.90. Bet Now!